Canon's LASER CLASS 710 Facsimile System offers you the flexibility and productivity you're looking for in a multifunctional office fax solution. With a LASER CLASS 710 Multifunction System, everyone in your workgroup has the power of a high volume Canon Laser Facsimile machine: a 19-ppm laser printer, 1200-dpi resolution, Super G3 Technology, a 35 scans-per-minute scanner, large document memory, and a 70-sheet document feeder. What\'s more, every machine has a convenient front-access design. 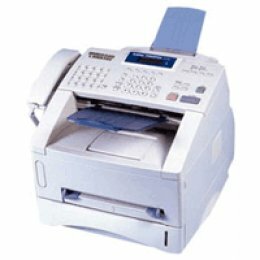 In addition, the LASER CLASS 710 offers Super G3 technology, a large standard memory of up to 512 pages (8MB) with the potential of up to 1,500 pages of memory, as well as a 19 ppm print speed, a standard 600-sheet paper capacity, and a range of network print and document management options. Internet Fax! The LASER CLASS 710 ships as a standalone facsimile machine with the ability to be upgraded to a true, Internet Facsimile System with the addition of the optional Printer Kit III and Network Kit III. This will enable the user to fax documents three different ways: I-Fax to I-Fax, I-Fax to PC, and PC to I-Fax. It is easy to use, extremely flexible and fast, and it will lower costs by virtually eliminating many of the phone line charges. High Speed, High Quality Output is standard on the LASER CLASS 700 Series. Documents are printed at a fast 19-ppm, even when printing at 1200-dpi. Canon's Ultra High Quality (UHQ) images will ensure excellent reproductions of every document that is scanned, sent, and/or copied. Super G3 Technology provides the fastest transmission speed attainable over the Public Switched Telephone Network. 33.6 Kbps Dual Line Option provides twice the fax line power and performance of standard facsimile machines. It enables the user to send or receive two faxes at once, or send and receive simultaneously. Both the primary and secondary fax lines operate at 33.6 Kbps. Productive Document Feeding via the 70-sheet Automatic Document Feeder. The Dual Access feature enhances fax productivity by allowing for transmission reservation during reception and memory transmission, and memory reception and transmission while the fax is in use as a convenience copier, or while printing reports. High Volume Paper Capacities. The LASER CLASS 710 comes standard with a paper supply of 600 sheets: two 250-sheet front loading adjustable cassettes and a 100-sheet multi-purpose tray, with the option of an additional 500-sheet letter-sized cassette. Memory: The LASER CLASS 710 comes standard with a memory of up to 510 pages (8MB), with the option to upgrade to 40MB, up to 1,500 pages. UHQ Image Processing Technology delivers excellent reproductions of every document that is scanned, sent, and/or copied.